Well I finally typed up the pattern and added it to my Free Patterns page. It’s too bad I didn’t get this up before winter finished, but at least it’s here for next winter. 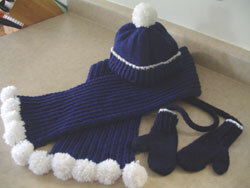 It’s a great way to knit up a custom set for any little boy or girl. Just pick two colors that match their winter coat and voila a great set to keep warm. Don’t worry about the delay, like you said, it’ll be available for next winter. And don’t forget that fall is already here in the South Hemisphere.